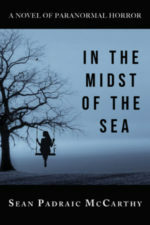 A moody, atmospheric and terrifying horror thriller reminiscent of classic Stephen King, In the Midst of the Sea is an impressive debut novel by a gifted new writer. In the Midst of the Sea is a gripping story of supernatural horror and psychological realism that slowly reveals that the greatest danger is the people closest to you in your own home. Trapped in an isolated old house on Martha’s Vineyard in winter, Diana Barlow is either seeing ghosts or losing her mind. After an estrangement from her parents, Diana came to Martha’s Vineyard to start a new life with her husband Ford and young daughter Samantha. The beautiful Victorian house that Ford inherited seemed the perfect home for a fresh beginning. But in the winter, when the tourists go home and the island is deserted, Diana is afraid she’s going crazy. Specters of people long dead flicker in and out of her vision. The antique dolls in her house never stay where they’re put. Samantha suddenly has a whole group of imaginary friends who live in the house and tell her terrible things. And Ford is becoming increasingly moody, unpredictable, and violent. The mysteries of the old house deepen when Diana finds a strange book in the basement — the journal of Elizabeth Steebe, whose husband built the house in 1871. Diana finds an eerie parallel between her own life and Elizabeth’s, as she reads Elizabeth’s fear-filled chronicle of her religion-crazed husband’s descent into abuse and insanity. As Diana researches Elizabeth’s fate, she begins to wonder whether the phantoms she encounters on the Vineyard are illusions or a glimpse into the past, and whether Elizabeth’s journal was left to her as a warning. While Diana investigates the horrifying history of the house, the past, the present, the living and the dead fatally intertwine, and Diana realizes she and her daughter must escape — if Ford and the house will let her. Audience: Horror and supernatural thriller readers. About the Author: Sean Padraic McCarthy’s short stories have appeared in Glimmer Train, The Hopkins Review, Supernatural Tales and numerous other journals. He is a ten-time Top 25 Finalist in the Glimmer Train Fiction Open Award, and a 2016 recipient of the Massachusetts Cultural Council’s Artist Fellowship in Fiction Award. He lives in Massachusetts.